-- Please Choose an Option --required for each student. For details see FAQs below. Watch the Getting Started Lesson below to see how it works. interest in science while building a firm foundation for upper level science courses. Prerequisite: Students should have completed or be taking Algebra 1 along with this course. Because the biological processes learned in biology are driven by chemical reactions, a good understanding of introductory chemistry is required to learn and understand biology. In 2010, the colleges change the requirements for Physical Science and re-named it Integrated Physics & Chemistry. This course should now have one full semester of introductory chemistry and one full semester of introductory physics. It should not contain any Earth or space science concepts that water down the chemistry and physics required to fully understand and enjoy upper level science courses. Most colleges now require Integrated Physics and Chemistry before Biology. Quarterly exams promote study habits similar to what a student should expect in college, where exams are given infrequently and cover a large amount of material. To give the student adequate time to study, there are no assignments during the week of the exam. If you would like a Pre-AP course, we recommend giving the exams with a "review sheet" and a one hour time limit. If you prefer a regular high school course, do the exam "open note". At this level we like the "review sheet" method because it best teaches students how to prioritize and organize the information, providing an easier transition from weekly to quarterly exams. Exams are interactive and feature auto-grading and grade recording. While our program is very comprehensive and includes video solutions to all worksheet and lab exercises, occasionally a little extra help is needed. Students and parents can email Dr. Shormann directly anytime they have a question concerning the course. Emails are answered within one business day. Designed for use as an honors or standard course, DIVE Integrated Physics & Chemistry teaches all the topics for the new requirement including Science and Christianity, measurement of matter, atoms, the Periodic Table, nuclear chemistry, chemical bonds and reactions, acids and bases, Newton’s laws, work and simple machines, gases and thermodynamics, electricity and magnetism, and light. Based on the scientific method, the video labs have many fun, engaging activities that draw students in and inspire them to learn more. Scroll down to view the full scope and sequence. Upon completion of DIVE IPC, students will be adept at working with the scientific method, developing lab skills that are above and beyond most of their peers. They will understand the importance of the energy sources used to power our world. Most importantly, students will have a better understanding of the laws God has woven into Creation. They will gain an appreciation for the rich Christian heritage that exists in science.With special emphasis on men like Isaac Newton and Michael Faraday, students will understand the importance of studying His Word and His Works as they seek to become good stewards of His creation. This self-paced eLearning course offers several advantages over the CD version. All homework, quizzes, and quarterly exams are automatically graded and the grades are stored in an online gradebook. There is no CD to lose or damage. Within 1-2 business days after purchase, you will receive an email titled "PARENTS: IMPORTANT Login Credentials" with a link to the eLearning campus, the student's user name, and password. If you don't receive it, please check your spam, updates, and trash folders, then contact us here. Start Date: The start date of your subscription is your purchase date. We no longer offer an optionto select a future start date. If you are not ready to start your course now, please wait and purchase when you are ready to start or want to access the course for planning, etc. To purchase this course, enter your student's name and email address, then click Add to Cart. Please allow two business day for our sales team to process your enrollment and send your login information. Your 12-month subscription starts when the student's profile is set up. Since this is a 32-week course with a 12 month subscription period, you have plenty of time for lesson planning, sickness, vacations, etc. This is a self-paced course. No deadlines or due dates are activated at login. Sample Course: Try it before you buy it! Excellent for my dyslexic student! 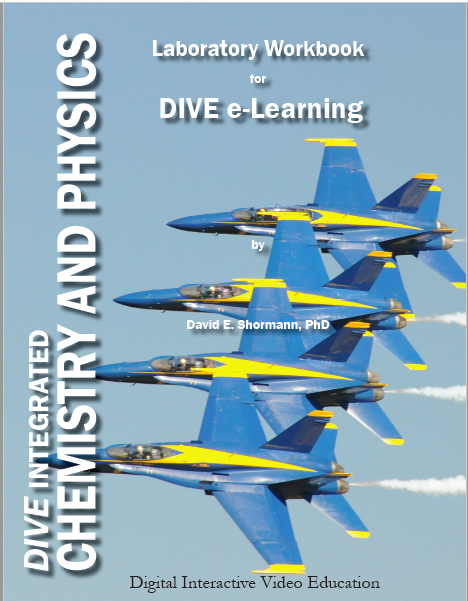 DIVE Integrated Chemistry & Physics has proven to be an excellent program for my daughter, who has dyslexia. She learns best using multi-sensory approaches, so video educational products are excellent for her. Dr. Shormann is easy to understand and he has written a workbook for assignments and labs that is a thorough coverage of the material. His labs make you feel like you're right there with him, which works great for those who can't afford the lab materials. His requirements are clear, and I appreciate that he allows the consumer the ability to print the workbook and glossary on our own. My daughter is working through this ICP course right now. This is the first time that she has taken her own notes for class. She is doing excellent. She enjoys the videos and the labs. I personally think that an actual video of the lab portion would be much more beneficial compared to just pictures, but she doesn't seem to mind. Also, the computerized interactive labs are very fun and interesting for her to learn from. I also like that she can contact Dr. Shormann with question instead of from me. As much as I am involved in what she is doing, I don't really understand everything about this curriculum. It's nice to have a teacher other than me explaining what she needs to do. Thank you! My two oldest sons have taken this course and gotten into highly ranked universities, including STEM focused colleges. They were well prepared for college science courses and sailed through. In part, I credit this course and the excellent biblical teaching that enabled them to sift through later science courses as they had to separate fact from fiction! They both love Dr. "Dave. :" I am sticking with it for my third son this year and will start my 4th kiddo with it when high school comes. It cal also be used as an honor level course!! Fantastic!! We are very satisfied with our purchase. Our son is thriving in the Algebra and ICP courses. Thank you for this absolutely wonderful program!!! After many years of homeschooling, after many different math programs, and after endless hours of research for the perfect program for our family...we have found it! My boys are both taking Shormann Algebra and we all could not be happier! As I write this, my boys are sitting with me at the kitchen table on their computers doing a DIVE ICP vocab game. I think it's called "Space Race". Never before in the history of their lives have they ever been so excited to learn any kind of vocabulary. Seriously...I am in awe watching them learn science with such enthusiasm. Our table is shaking from them tying in answers as fast as they can. I can't thank you enough! My daughter enjoys the curriculum and does well with it. Our family has just received DIVE Algebra 1 and DIVE Science ICP. I have also spent the past two weeks in intensive preparations regarding this year’s studies for our children. I try to be very thorough, intentional, organized and on and on. It is no small task. I am familiar with the effort required to put together a quality program. I mention this because I am blown away by the thorough, God-honoring, educationally superior, forward thinking curriculum you have put together. It is astounding, actually, and I am very grateful for all of your efforts. You have created a truly anointed program that will equip and affect many, many lives. The work you have put into this, offering different textbook “spines” and the accompanying syllabi, the internet links that are direct, appropriate, and rich in material, the forward thinking CLEP and honors paths, the reinforcements that allow for actual retention…It is all just amazing and I want to thank you for all of the immense effort and time you have invested in this program. I’m so excited to begin this year of study! My daughter took this course as a ninth grader and really enjoyed it. She used the Bob Jones textbook and said it was the best and most interesting she's ever used. She did well in the class and had good success emailing Dr. Shormann and getting timely responses. She found a few mistakes in the course of the year which she alerted Dr. Shormann about so hopefully, those will be fixed for the future. We were so satisfied with the class that she plans to continue with the DIVE high school science lineup. My daughter was really truffling with the traditional science (apologia) method of reading/testing. But the DIVE method of reading and hen listening has really imp ted how she is learning the material. Even though DIVE is more difficult she is actually doing much better. We are homeschoolers. My son is in 9th grade. We are both enjoying The Integrated Chemistry and Physics Program! No textbook needed, readings come from online sites. Vocabulary review site is fun and challenging. Lecturer is articulate and precise. Labs sheets can be printed out each week. Lab video is also easy to understand. Online testing and scoring is great. We love Science and we are learning a lot from this course. I would recommend this to all 9th grade homeschoolers.